Skylanders: Spyro’s Adventure on the 3DS creates a whole new genre, bringing together the world of toys and videogames. Skylanders: Spyro’s Adventure on the 3DS creates a whole new genre, bringing together the world of toys and videogames. Your action figure becomes an interaction figure. 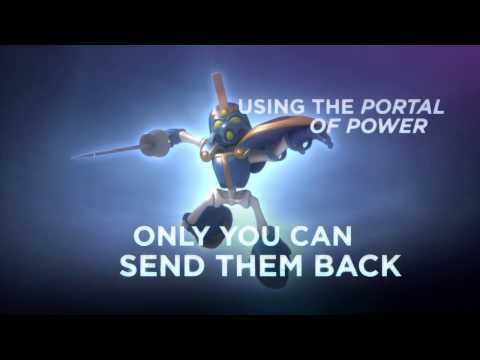 Skylanders: Spyro’s Adventure includes a copy of Skylanders: Spyro’s Adventure, a Portal of Power and 3 toys to start off your collection: Dark Spyro, Ignitor and Stealth Elf. With a further 29 character toys available to purchase separately, you are sure to find the perfect hero for you. Skyland has been conquered by Chaos, its protectors frozen and banished to earth. You are the Portal Master, controller of the Portal of Power. Only you can unfreeze Spyro and his pals and rescue Skyland from Chaos’ villainous clutches. Each toy is a protector of Skyland, frozen by Chaos and banished to earth as a toy. Place your toy on the Portal of Power to watch them appear in the game ready to do your bidding, well, you are the Portal Master after all. If a second player wants to join the game at anytime, add their toy, next to the first toy on the Portal of Power, and they will join you. If you need to change your character to access their unique abilities simply switch out your current toy and put another on the Portal of Power. The toys themselves offer many features, providing you with a host of new characters and abilities to help Spyro save the day once again. Smart - They can save progress in the game, including all your loot, money, hats, upgrades and Portal Gates you have unlocked. Upgradeable -Choose what upgrades you want and unlock different abilities that will allow you to access different areas. Then reset your character to play the game in a whole new way. Elemental - Each character is linked to an element which grants them unique abilities. You, the Portal Master, must co-ordinate their abilities to progress through the challenges that lie ahead. Sociable - They also work from console to console so you can take them around to a friend’s house to play. Defeat Chaos and join Spyro and the other saviours of Skyland in a truly different kind of adventure!